If you've been an avid reader of my blog for some time, you'll know that I created a separate domain specifically for all things interior-design. As you can see, however, it's turned into an online graveyard over the past few years, and so I vowed to keep things simple by posting everything from Emilicia Style going forward. It had been so long since I'd written an interior design post that I really missed talking about all things decor. I actually had plans to write about my student bedrooms, but sadly never got round to it due to the workload. 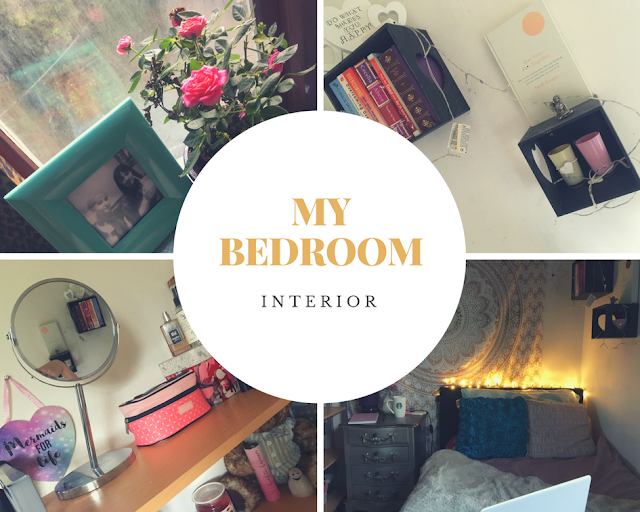 And as you can see, the last 'bedroom tour' post of mine is severely outdated, as well as drastically different to how my current bedroom looks now! So of course, an update was absolutely necessary, especially now that I'm living back at home and have given my room a much-needed makeover. Before the big change, there were actually two beds in my room – one for my sister and one for me. However, since she moved out a couple of years ago, and I’m finally back after three years at university, we decided (‘we’ being help from my good old dad) to get rid of one to create significantly more space. I have a pretty small room, so it’s honestly a miracle that both my sister and I even fit all of our stuff in here at one time, so I needed to begin by eliminating useless things and creating a somewhat-spacious environment. As you can see, there’s still a lot of clutter (including boxes I haven’t been able to unpack that I’ve tried my best to omit from view!). I utilise all of my resources, though, by at least giving the clutter its assigned place – for example, a box full of shoes covered by my furry cape coat, which also happens to make a wonderful blanket. The bin is discreetly located under the straw end table next to the mini fridge, and a shelving unit on the opposite side gives me a place to place any trinkets, beauty supplies, and decorative bits. I still have the signature vintage-silver bedside chest of drawers (from Dunelm Mill) next to the bed, with each drawer hiding away even more stuff, and two shelves my sister purchased and re-painted to hang nicely on the wall, for books and candles etc. I love the heart-cut out! The huge tapestry on the wall is also a favourite of mine: until I get around to re-painting my room, it works well as a feature wall piece to (hopefully) distract from any untidiness. I like to keep my bedside table as neat as possible – a mug for tea before bed or a coffee to kick-start the day ahead in my Starbucks mug. The purple lamp is an old staple piece from our former bedroom décor (purples and lilacs galore) that I think fits nicely with my Orchid plant complete with vase. It's fake right down to the water inside of the vase, but hey, at least it requires zero maintenance. That odd looking thing next to the plant is one of my many, many wacky phone cases. I got this one from Wish, which I think may be a replica of a similar one from Valfre, and is essentially a giant ‘chill’ pill. The thing on top of my phone case is a Jenna Marbles Popsocket featuring her two lovely dogs, Marbles and Kermit, gazing off romantically into space (this case is usually on my phone but I like to live dangerously and let my iPhone breathe a little whilst I’m actually indoors). I also like to keep a little notebook nearby in case I get any sudden bouts of inspiration to jot things down – the pink notebook (on top) is from Wilkos and the one underneath is a journal I received as a gift – formally known as The Happiness Planner. As you can see, there’s all sorts of random tat on this shelf, but that’s the way I like it! The top of the shelf in particular is where I’ll usually stand to do my make-up for the day, so I keep my mirror there along with my go-to Benefit make-up bag and Real Technique brushes. I also leave some fragrances around for me to pick and choose from, and whatever necklace or choker I wanna wear is right there conveniently within my reach, hanging down from the mini mannequin. The cute ‘mermaids for life’ sign was a birthday gift from my sister – something pretty to look at whilst I work on my face 😉. Flamingo fairy lights – super cheap purchase from eBay that add so much personality to a room! The pretty boxed shelves that complement my bed area so nicely are packed with a mixture of fiction and self-help books, and the other – you guessed it – more candles! The fairy figure on top was a present from my mum that contains my October birth stone Opal, giving off a dreamy feel. Underneath the fleece blanket is a little hidden laundry bin, that I’ve re-purposed for now as a storage unit for my bedding (the basket is discoloured and grotty-looking from age, so a blanket thrown on top provides a tidier appearance). On top, I've displayed another big scented candle, a photo frame of me and my boyfriend, and a 3D photo block of a family holiday in France. Next to this I hide away my PC tower with a Ted Baker shoe box and Bluetooth speaker, connected to my Deep House Relax Spotify playlist I have on in the background whilst going about my business. My windows are definitely overdue for a clean after our house was repainted a few months ago, but I try to disguise that by placing some pretty things on my windowsill. The gorgeous blue 'bird' box was part of a gift set from Laura Ashley containing lots of lovely bath toiletries, which I’ve converted into a second storage place for books I’ve yet to read. Attempting to colour co-ordinate with the turquoise photo frame of my mum and I, I also placed some pink roses alongside (real this time!) to absorb the sunlight and give a pop of colour. Unfortunately these ones are real and seemingly reaching their inevitable end! Yet again, in an attempt to disguise the ugly stained window, I placed my huge mirror in the middle and I think it works pretty well. 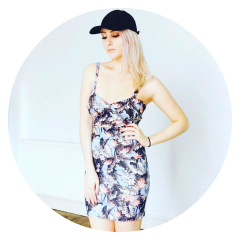 Something about placing mirrors in various places around a room can give the impression of a larger space, and we all need a full-view mirror when choosing our outfits for the day. In the middle, another impulse spend from Wilkos: a cute floral storage box to match the rest of the turquoise/blues. Adorable picture of our old family pet Honey - can you tell I’m sentimental? World map I bought for my sister from Urban Outfitters – you scratch off the places you’ve been to with a coin and it changes colour. The gold matches well with the wall tapestry. I bought this mini whiteboard whilst at uni and it really comes in handy for quickly writing down any shopping or to-do lists. And of course, hung next to my desk where it is most convenient! Aside from the bed, my desk is the main centrepiece of the bedroom. Although I don’t use it very often due to how incredibly slow it runs, I like having a desktop computer, and this is where I’ll usually do any work, blogging, or eBaying. Whatever requires some concentration! I found these free artwork printables through various websites on Pinterest, and not only do they help lift your mood as soon as you walk through the door, they can also provide a much-needed boost of inspiration when I fancy my hand at some writing. I tried to choose pictures amongst the same colour scheme so that they would complement each other, without overdoing it on the motivational quotes! I also found some very cute mini printable calendars – a different design for every month. The positioning of this skull moneybank (from Home Bargains!) honestly depends on my mood, but usually on my desk you’ll find a pencil pot, another mini Bluetooth speaker, a notebook, and a lamp. This time it’s The Happiness Planner, which also tends to shift about depending on what time of day I choose to journal! Storage boxes upon storage boxes – conveniently cut out from view in this photo! Anyone who knows me knows I adore candles, particularly Yankee Candle. I got this ‘simply home’ edition from B&M, and the grapefruit smells gorgeous! Unfortunately I go through candles like there’s no tomorrow, and I’m always needing more. Even if they’re huge like this one! So there we have it, my room in another spectacular view (sorry, I need a better camera and/or tripod!). You can see the moving boxes I’ve tried to disguise with bath mats, towels, and suitcases, but all in all I really love my room now minus the odd bit of clutter I can’t yet eliminate. It feels cosy, homely, and feminine, all things which I think make a bedroom the best place to be. Let me know if you liked this post, or if you have any questions about my room, and I’ll potentially make more interior-design themed posts in the future.